What is the best way to hang a large mirror. 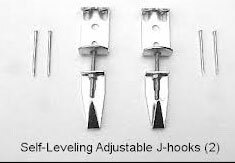 The best hanging hardware for most walls is the J-hook. It is designed to keep the nail that goes into the wall at a sharp angle, so that even in drywall, it will stay in place. It is important that the J-hook be properly weighted for the item you want to hang. Mostly the price. With today's technology, a solid core polyurethane frame feels and looks like wood. It lasts just as long as wood and absorbs a finish just like wood. The other type of frame construction used frequently is metal, either wrought iron or hand forged steel.